Hello! I must admit, I'm actually embarrassed to post this card today. I don't like it, it's not my style, and as most of you already know, I don't even like hunting! 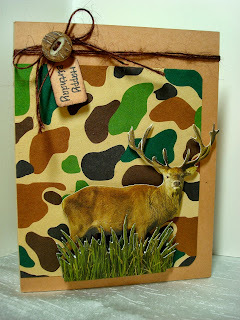 However, I had to make a masculine birthday for a young man who loves to hunt, comes from a family of hunters, and whose first name is 'Hunter'. Thus making a pretty card, my style, would be completely inappropriate. LOL! Besides, I know many of you are always looking for ideas for cards that the men in our lives would actually LIKE to receive, so here you go! The main image is a 3D sticker from The Paper House. This sticker set is perfect for the hunter in your life, as there are a lot of different hunting themed stickers in this package. I kept the card simple, by using Creamy Caramel as my card base, and one layer of camouflage designer paper. The only embellishment is a button and twine, and a sentiment tag. The sketch is ISSC39. Here's a close up of the sticker for you! Great masculine card!! I'm sure Hunter will love it! Embarrassed? I don't know why! I think this is such a great masculine design with the camouflage background and such a great image! I think it is fabulous and as I am married to a man who loves hunting I know your'Hunter' will love it. Know mine would. I am certainly not into hunting myself but I do cook and eat it!